This delicious classic lemon tart, encased in a beautiful sweet pastry, is topped with thin slices of goats’ cheese before being caramelised and served. There’s something really wonderful about lemon desserts, don’t you think? Whether it’s a lemon meringue pie, tart aux citron or a lemon mousse, I just love them. They’re fresh, zingy and well, simply delicious! Mr E & I even chose to have the classic lemon tart to round off our wedding breakfast! Simply delicious! A few short months ago I found myself watching ‘The Box’ hosted by the wonderful James Martin, I think the BBC are even repeating it at the moment. It’s a great series in its own right but what I particularly enjoyed about each programme was hearing the numerous tips which James shared. One of those tips was showing how well lemon works with goats’ cheese. Immediately I knew I had to try that idea in a lemon tart so it made its way to my ‘to make list’ and here it is. 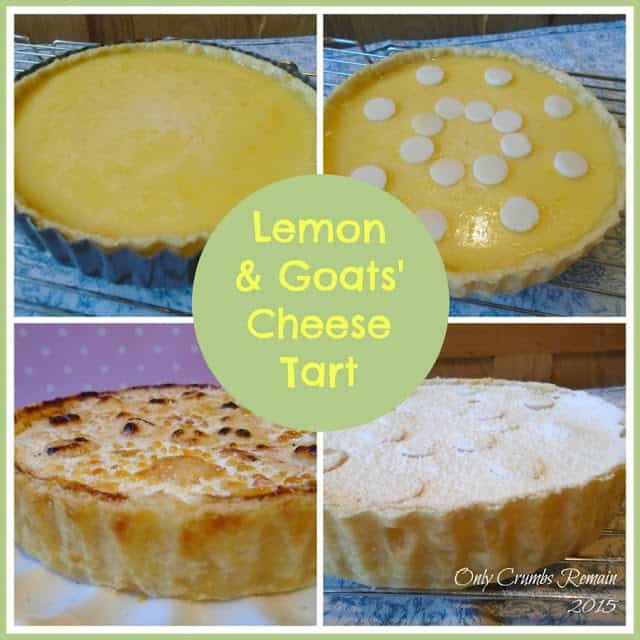 I decided to try the combination by making a classic lemon tart and dressing the top of the tart with thin slices of hard goats’ cheese rather than incorporating a soft version within the curd filling. It’s a really straight forward bake, the most difficult step was making the pastry. Now, I personally enjoy making pastry but if you don’t have the time or inclination to make your own then a shop bought ready rolled short crust would be just as great, or even a cooked pastry case (assuming there’s no breaks in it!) Once the pastry case is blind baked it’s simply a case of reducing the oven temperature and pouring the zesty lemon mixture into the case and allowing it to bake slowly for just over an hour. Once baked it needs to cool fully for a further hour before being decorated with thin circles of hard goats’ cheese, and a liberal dusting of icing sugar. It is then caramelised under the grill or with a cooks blow torch (and don’t do what I did by leaving the kitchen, even for a moment, whilst it’s caramelising under the grill!). The lemon tart with goats’ cheese certainly didn’t disappoint. The creaminess of the goats’ cheese worked well against the sharpness of the lemon. There was certainly a good lemon hit to the curd filling, without causing any facial puckering, and the caramelised sugar top gave a lovely crunch to the proceedings. So with the citrus zing, creamy goats’ cheese and caramelised notes all encased in a short pastry, it is certainly a dessert to relish with friends and family. Inspired from: Tips shared by James Martin on ‘The Box’. 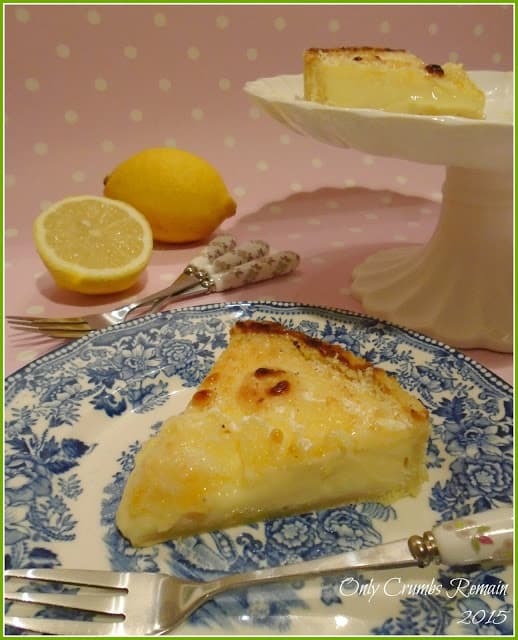 The lemon filling is a reduced quantity from the classic Lemon Tart in the book ‘Desserts‘ by James Martin. 1. Make the pastry. Place the flour, salt, icing sugar and cubed chilled butter into a good sized bowl. Rub the butter into the flour between your thumb and finger tips, until the mixture resembles breadcrumbs. Make a well in the centre of the breadcrumbs and add the beaten egg. Using a rounded pallet knife, or similar, cut through the mixture to make a dough. You may need to add a little cold water to fully bring the mixture together. Tip the dough onto a lightly floured work surface and lightly knead the dough for 10 seconds. Shape the pastry into a ball and flatten into a disc. Wrap in cling film and place into the fridge for 20 minutes to chill. 2. Line the flan tin. Remove the pastry from the fridge and place onto a lightly floured work surface. Roll the pastry out until it is nice and thin, about 2 – 3mm. Wrap the pastry around the rolling pin, lift it up (using the pin) and place into the flan tin. Gently tease the pastry into the case so that it sits into the edges well and picks up the shape of the fluted sides. Avoid stretching the pastry. If the pastry tears, patch it with surplus pastry. If the pastry over hangs the sides of the flan tin excessively, use a pair of clean scissors to trim off some of the excess. Place the lined tart case into the fridge to chill for a further 10 minutes. 3. Pre-heat the oven to 200c / 180 fan / Gas 6. Place a baking tray onto the middle shelf which is large enough to house the flan tin. 4. Blind bake the pastry. Remove the lined flan tin from the fridge. Cut a sheet of grease proof paper large enough to cover the flan tin. Scrunch it up and open it out. Gently lay it on top of the pastry, easing it into the edges. Weigh the paper down with baking beans or uncooked rice. Place into the oven (on the heated baking tray) and bake for 10 minutes. After 10 minutes, remove the baking beans and grease proof paper. Using a sharp knife trim off the excess pastry from around the pastry case. Return the pastry to the oven and bake for a further 4 or 5 minutes until the pastry base has turned golden. 5. Prepare the lemon filling. Whilst the pastry is baking make the lemon filling. Break the eggs into a 1L capacity Pyrex jug (or similar) and beat with a fork. Add the sugar and cream and mix. Squeeze in the lemon juice and mix again. Strain the mixture through a sieve into a bowl. Dispose of the waste caught by the sieve and strain the mixture again back into the jug. Add the lemon zest to the mixture and stir well. 6. Reduce the oven temperature to 100c / Fan 80 / Gas 1/2. 7. Fill the pastry case. Fill the pastry case with the lemon mixture whilst it is in the oven. This reduces the risk of it spilling down the back of the pastry case. Draw out the baking tray that the pastry case is sat upon and carefully pour the lemon mixture into the case as full as you dare. Slowly push the baking tray back into the oven. 8. Bake. 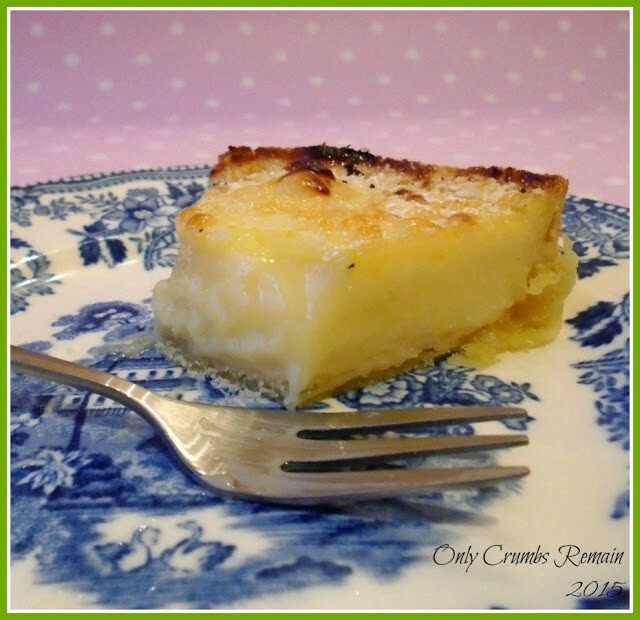 Bake the lemon tart for 75 – 85 minutes. The tart will still have a very slight wobble in the centre once it is ready. It will continue cooking a little from the residual heat once it is removed from the oven. Once baked, remove from the oven and place onto a cooling tray. Remove from the flan case after 5 – 10 minutes and allow to fully cool for at least an hour. 10. Cool. 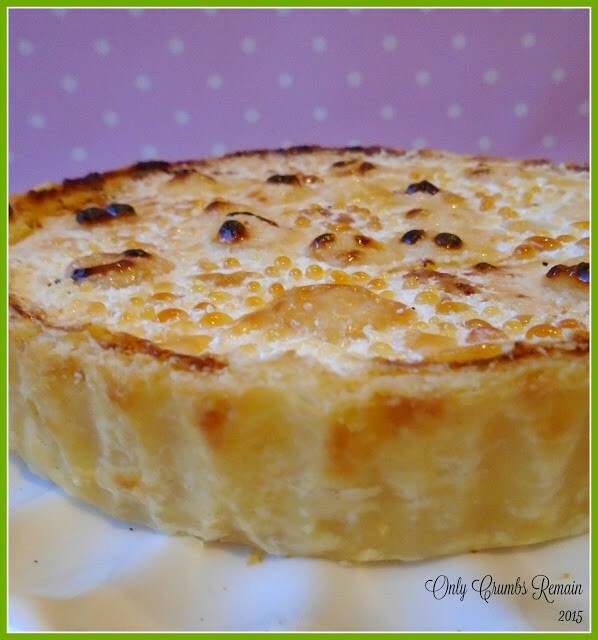 Allow the tart to cool fully before serving with cream. I adore goats cheese and I can well imagine that the two flavours go really well together. I must try it! Thank you for joining in with Perfecting Patisserie! It's a delicious cheese isn't it being so mild and creamy. It certainly did work really well with the sharpness of the lemon. Aw Thank you Becky. It was a pleasure to link up. Lemon Tart is simply gorgeous isn't it, and the addition of goats' cheese to the top really is delicious! It certainly intrigued me when James Martin shared the tip on The Box. We thoroughly enjoyed it and I'll certainly be using that flavour combination again. Totally agree Lucy, lemon tart is fabulous! I'd love to say the goats' cheese addition was my own idea, but as I mentioned I was completely inspired by James Martin. Aw thank you Kirsty 🙂 The idea has been on my 'to do list' for far too many weeks – I'd have tried it sooner but the time consuming GBBO bakes which I was challenging myself with meant it was side tracked for a while. We really enjoyed the goats' cheese & lemon combo, I'm definitely going to be trying it in other variations! Nor would I, but when I saw James Martin demonstrate it and his non-professional cooks try it and clearly enjoy it I certainly had to try (especially as I love anything lemon and enjoy goats' cheese).